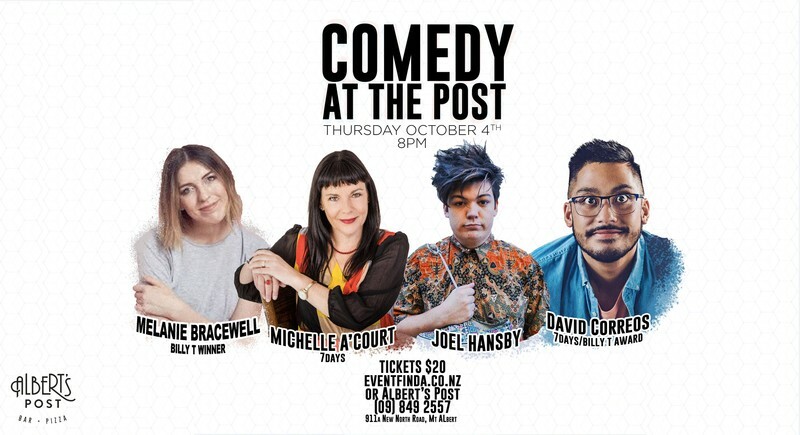 Comedy at the Post returns once more with another outstanding lineup. Come down to Albert's Post for a night of non stop laughter and top notch food and drink. All our previous shows have sold out weeks in advance so don't delay in getting your tickets. Either online or at Albert's Post. Michele is one of the biggest acts in New Zealand comedy, appearing all over our screens on shows like 7 Days. She has won innumerable awards including NZ Female Comedian of the Decade” in 2010, and was presented with the VAC Reilly Comedy Award for Excellence in 2015. Melanie is a multi award winning comedian, including the 2018 Billy T award. She has appeared on 7 Days, is a writer for The Project and has been called “A master of the stage.” by the NZ Herald. David is the 2014 Billy T award winner whose solo shows are always a smash hit at both the New Zealand International Comedy Festival and the world renowned Edinburgh Fringe Festival. Joel Hansby, 2015 Wellington Raw comedy quest winner, captures audiences with his awkward charm. Joel will have the audience in fits of laughter with some of the sharpest one liners in the country.